September 15 is International Dot Day! Breakout EDU has joined forces with author Peter H. Reynolds and designed a custom game to celebrate International Dot Day. The Dot is a story about a teacher who helps students trust their own abilities and encourages them to “make their mark” on the world. At Breakout EDU, we believe that learning can be fun and full of adventure. By combining the magic of The Dot and the power of Breakout EDU, teachers can unlock the potential in all their students! We can’t wait to hear what your students think about the game! See how teachers have used Breakout EDU to celebrate International Dot Day last year! 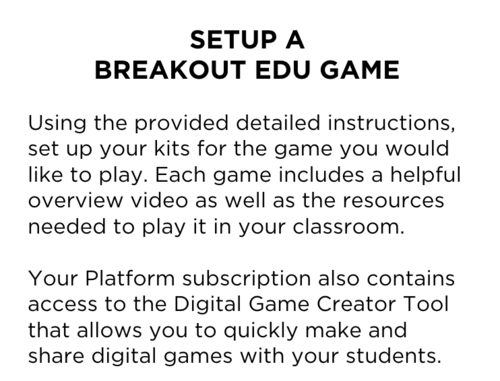 With the latest update to the Breakout EDU platform students can now design their own digital games. By having students design games aligned to specific academic topics or skills, teachers transfer the ownership of learning from teacher to student. Once the students are comfortable with the design tools it will be a great way to ease the burden of lesson planning. You will have peace of mind knowing that your students are working at the top of Bloom’s Taxonomy. Teachers now have the option of adding student created games to a private classroom library where other students in the class can play their peer games. This is a fun way to review any academic topic before a test. Teachers have the ability to create and manage classes. 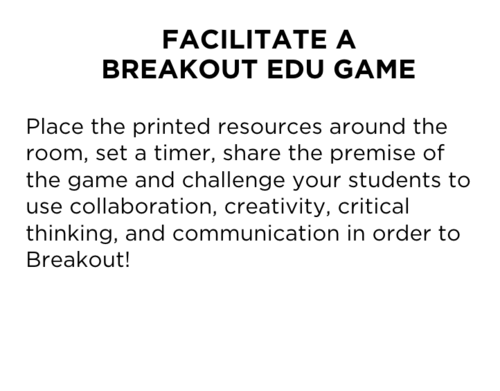 This streamlines the facilitation of Breakout EDU digital games. With a few clicks of the mouse teachers can now assign digital games to their classes. This makes for a perfect “do now” activity or formative assessment. Teachers can either choose pre-created games from the platform library or build their own using the digital game builder. Once you’ve created a class in your Breakout EDU account anytime your student completes one of the assigned digital games you will see the results. You can see how many puzzles they completed and how long it took them. You also have the ability to download the results to a spreadsheet. 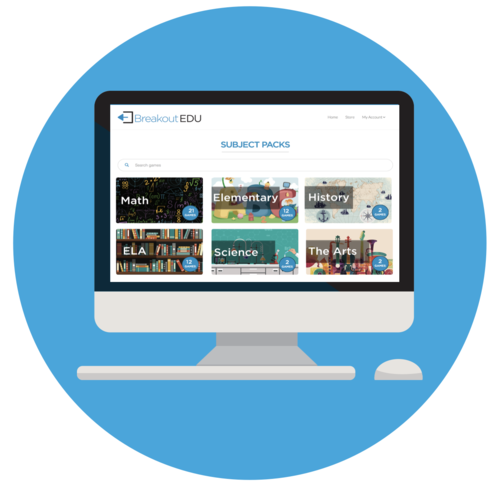 The summer of 2018 was a busy one for our team and we’re excited to share what’s new with your Breakout EDU account. 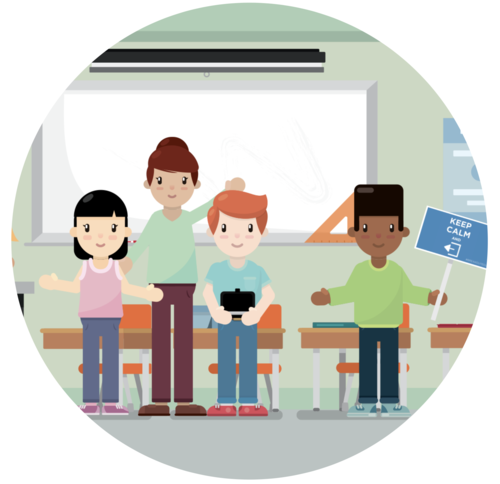 With full platform access, teachers can now add classes and have their own students design digital Breakout EDU games. Students submit their games for approval and you can add them to a classroom library where students will be able to play their games. This is a perfect way to “level up” any classroom assignment. We recently released more than 150 new digital Subject Pack games on the platform. With the class feature, teachers can quickly assign these games to your students and view their results. 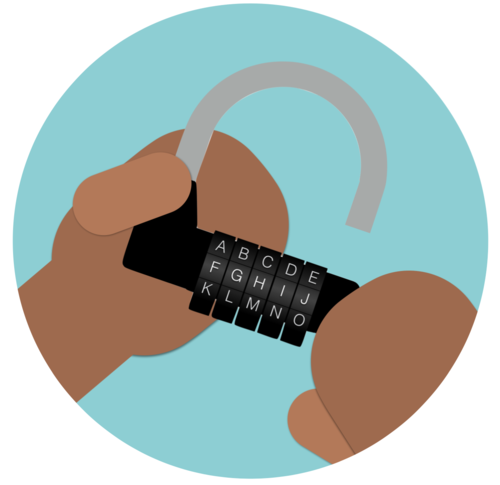 New Breakout EDU Apps for Android and iOS! Tags by Breakout EDU is a new app by allows you to quickly and easily scan custom Breakout EDU tags to play digital games right on your mobile device. In addition, there is a QR Code scanner and RFID Scanner to allow players to unlock game content. 200 NEW BREAKOUT EDU GAMES! 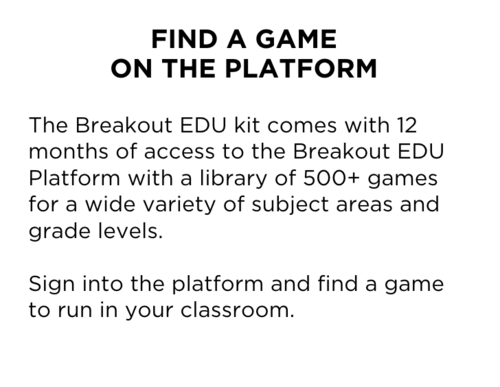 We’re excited to be launching 140 new Breakout EDU digital subjects pack games and 60 new physical subject pack games. 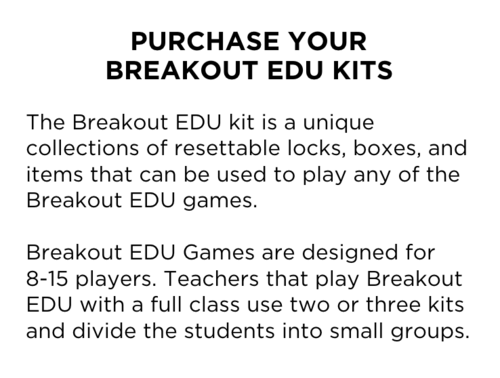 All games are included with Full Access to the Breakout EDU Platform. This brings the Breakout EDU game library to more than 800 games! Below is the complete list of the new games that we released today. All of these games can be found through the search on the Breakout EDU Platform. HERE ARE four NEW Breakout EDU games that are perfect for Back to School! We hope you had a great summer relaxing and readying yourselves for another awesome school year ahead. In addition to these four new games, the Breakout EDU team has been cooking up something very special that we will be sharing with you in the coming weeks. We have added all of these new games, as well as last years' back to school games, to the Featured Games section of the website. New to Breakout EDU? Click here to learn more. Vacations are awesome, but it is time to get back to school! We want to celebrate with our Back to School Boogie, but our license to dance is locked up! We didn’t want the teachers to start dancing without us so we put it in the Breakout EDU box to keep it safe. We left the combinations written in dance codes around the room. Help us figure out the clues so we can open the Box and get our Back to School Boogie On! Your college applications have been turned in, or have they? Letters have arrived from five schools letting you know they are missing part of your application and if you don’t get it in on time, it will mean you will not be accepted to any of the schools you applied to. Luckily the letters will help you get started and figure out how to open the Large Breakout Box, and make sure your Application is Accepted! The clock is ticking and you only have 45 minutes! The principal just won the lottery and abruptly left the back to school meeting. She said, "I'm outta here! If you need me, I'll be on my newly purchased private island near Fiji without my cell phone or access to email. Everything you will need for another great year is in this room. Good luck!" The Breakout EDU team has built three new physical games perfect for a fun activity to wrap up your school year. We hope you have a great conclusion to the year and a rejuvenating Summer! "Good Morning Campers! Time to Get ready for some camping fun! Now before we get started, has anyone seen my Camp Guidebook? I think I locked it in the Breakout EDU box, but I don’t know how to get it open. Will you please help me out? We need to hurry as we only have 45 minutes before I need my Guidebook to get Camp Started!" Let’s tell some spooky campfire stories! My favorite is the one about the lady who found (and ate) a big, hairy toe that she found in the forest. No one living in the region ever saw the lady again. The only clue to her disappearance was a giant footprint a neighbor found in the loose soil of the meadow beside the house. The footprint was missing the left big toe. How does the story end? Let’s toast some S’mores and find out! A strange virus is spreading across Castle Rock County. The early symptoms of the infection appear to impact the vocal cords of those afflicted with this disease. The U.S. Disease Control Center needs your help to figure out the root causes of the virus before it spreads from teachers to students.